The Polarization Beam Combiner / Splitter is a compact high performance lightwave component that combines two orthogonal polarization signals into one output fiber. The most common application is to combine the light of two pump lasers into a single fiber to double the pump power to an Erbium-Doped Fiber Amplifier (EDFA) or a Raman Amplifier. 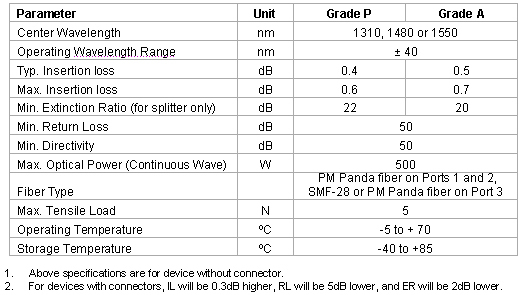 The typical configuration uses two PM fibers for the input and the SM fiber for the output. The device can also be used as a beam splitter.